Here's a followup from my previous post that previewed Data Lists in Alfresco Share. This time I give a demonstration of the rules capability in the Alfresco Share 3.3 Community release. 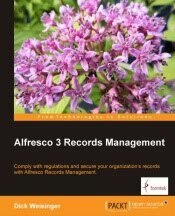 Rules are not new to Alfresco. They've been in the Explorer client for some time. But being able to specify them from Share is new. And the UI for managing them is a nice improvement over the JSF-based screens of Explorer. While there's a 3.3 release downloadable now, as of this writing, bug fixes for rules in Share seems to be quite active. What I show here was made with a build from the latest source code in the SVN Head area that I made this morning. The Alfresco Share 3.3 version is certainly shaping up. And the new rules capability in it really add to the usability of the product.